The entire Cambridge parkrun course was replicated in this short section. I took this pic on my warm up route and met a runner who warned me I would need a boat to proceed further. Many of the puddles occupied the entire width of the path so avoidance wasn’t an option. The rain held off but temperatures were low (for me) at around 2-4c. Despite the weather, 359 splashed their way round and it really was good fun. 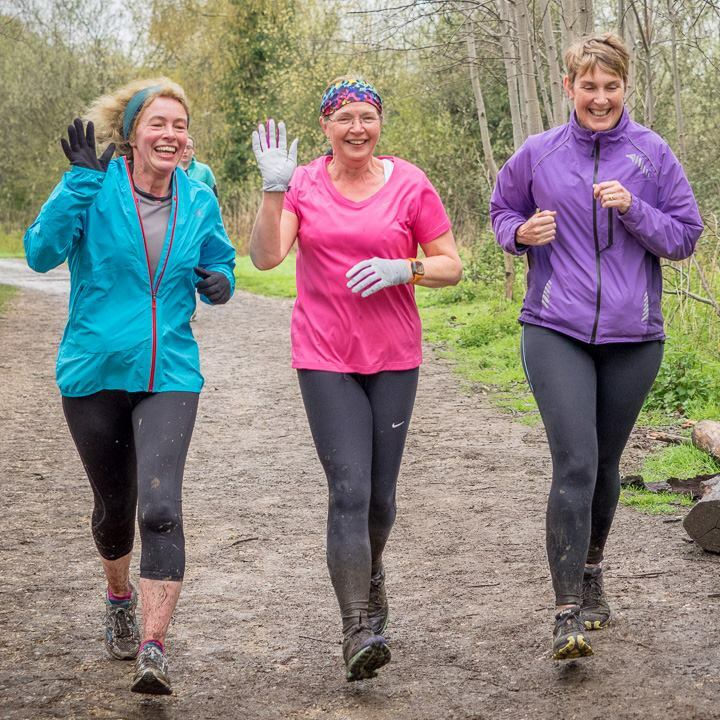 Here’s a good picture of Lorna (in the middle) with running (and chatting) chums. Looks completely normal. Here’s Lorna at the end of the race and about to receive her number token. Something has happened in the time these two pics were taken and I’ve yet to receive an adequate explanation. How long was she running while munching her glove. This certainly isn’t normal! Tomorrow I’m doing a 10k race at the Icworth Estate, Bury St. Edmunds, Suffolk. This promises to be another mud bath which raises the possibility that we mud splattered runners won’t be admitted to their very nice cafe/restaurant. or even worse, I’ll be turned away from their second hand bookshop. Me : Do you realise I’m a National Trust member and therefore entitled to benefit from the full panoply of facilities and privileges which are accorded to my subscription? National Trust official : On your bike, sunshine, and come back when you’ve had a bath and smell a lot sweeter! 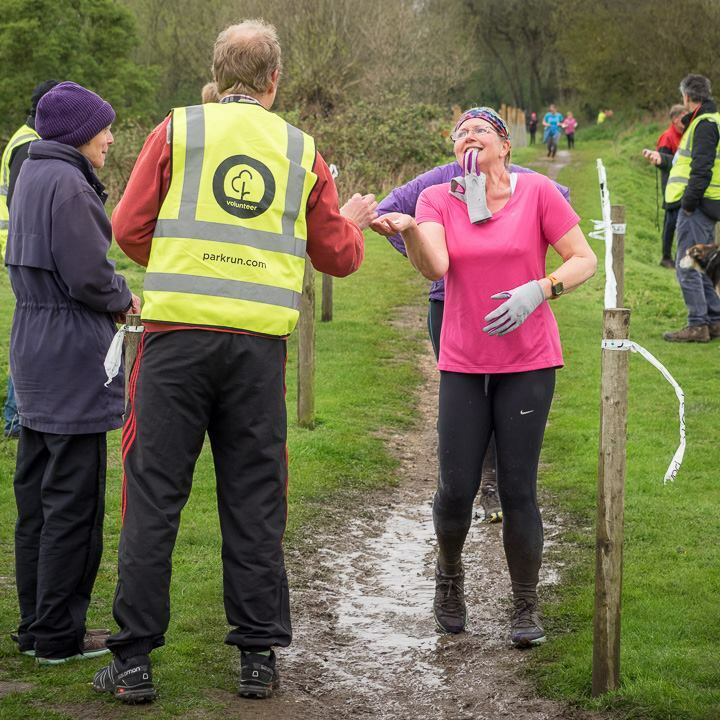 Thanks to Stoke Gifford Parish Council, parkrun is national news following their decision to charge parkrun or parkrunners for using the open spaces of Little Stoke park as a course. They’ve been roundly condemned for this move because it contradicts the founding principles of parkrun and constitutes a degradation the philosophy of a free, inclusive, volunteer organised, run for all. There are nearly 400 UK parkruns and around 850 worldwide. Additionally there are about 90 Junior UK parkruns. Stoke Gifford Parish Council are very naughty, very foolish, very short sighted and probably Tory dominated. This entry was posted in Am I Being Unfair?, Books, Cambridge, evil Tories, Heart disease, Heartless Tories, junior parkrun, miserable weather, parkrun, Running, running races, running with heart disease, second hand bookshops, Uncategorized and tagged books, gardening, heart disorder, junior parkrun, mud, parkrun, reading, running, second hand bookshops, Stoke Gifford Parish Council. Bookmark the permalink. ← It’s all about me, again!